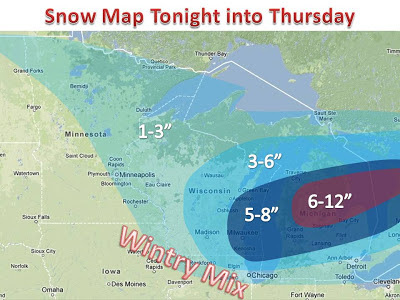 Yet another snow maker to impact the Midwest tonight and tomorrow. A clipper will merge with a deepening area of low pressure. The intensification will occur tonight and reach its peak over Michigan, where up to a foot of snow is possible on some places. On the south side a rain to ice to snow will hit areas such as northern IL. Some of the snow in northern MN has already fallen, so the map on the left should be taken as a storm total. Be sure to check back for updates, also on our facebook page which you can view by clicking "social" in the tabs above.